Gold continues to make headway in herky-jerky fashion, failing to satisfy bulls but also denying bears something to cheer about. On Monday, the February COMEX contract rallied to within a millimeter of the 1240.20 Hidden Pivot target shown. The pullback so far has been mild, encouraging the thought that the next pop will be good for a ride to 1259.80. Another encouraging sign is that some recent ‘mechanical’ buy signals in gold vehicles, including one in HUI, the Gold Bugs Index, have been winners. We’d sworn off them after getting stopped out once in the former, but they seem to be working again. This implies that buying enthusiasm has picked up a little over the last couple of weeks. 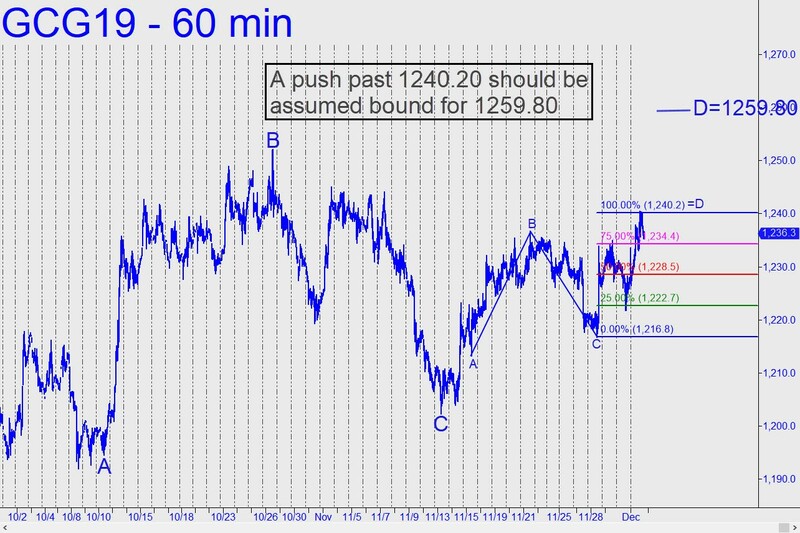 For your information, the February futures is currently on a ‘mechanical’ buy signal that tripped at 1216.80, stop 1202.40. If you don’t subscribe but want a peak behind the headlines, click here for a free two-week trial to Rick’s Picks. It will give you instant access to all features and services, including a 24/7 chat room where great traders from around the world share ideas that can help you make money.